He was, quite simply, the love of my life. 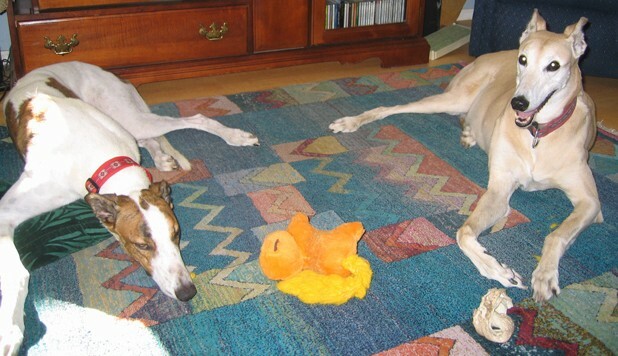 We’d had Devon, our first greyhound, for a few months. He had been rather morose since we’d brought him home, so we decided he might be happier if we acquired another pack member for him. We called Judy and inquired about the availability of any potential adoptees. A few days later she called to let us know she had extradited “the most beautiful champagne” greyhound she had ever seen from an undesirable situation. For the last six months, he had been relegated to the backyard of his first off-track residence with nothing more than a human pillow for warmth and companionship. We made arrangements to come by and meet him. We arrived at Judy’s midafternoon on a Saturday with Devon in tow. At the time Judy was caring for four or five greyhounds, all of whom came bounding out the door to greet us. Sure enough, one of them was a gorgeous champagne-colored greyhound. On his papers he was named “Patsy Quick.” They called him “Buddy” at the track. We’d been there about 3 minutes when he ran over to our Honda CR-V, the back of which had been left open after letting Devon out. The next thing we knew, Buddy had jumped in and refused to leave. What were we to do? We brought him home with and named him Dante because we had rescued him from hell. He was high strung, and had some separation issues. He hated thunder and whenever there was a storm, he would seek the safety of “his closet.” About a week into his life with us, he and his brother had an alpha-dog issue. We heard Dante let out a blood-curdling scream, and when we got him into the house, we discovered he had a nice tear in his throat. Off we went to the vet, where we learned the bite had just missed an artery. If that had been severed he would have bled out before we got him to the clinic. Not too long after that incident, he presented one day with an enormous swelling just under his jaw. Back to the vet for more surgery. A biopsy revealed cancer. Our vet told us she’d cleaned around the swelling as best as she could, but told us it was unlikely he would survive the year. Well, he did, and became known as the miracle dog, surviving his older brother Devon, and his after-acquired sister, B’mer, as well as another throat tear and an enlarged spleen. Two years ago, my brother John came for an extended stay. Dante fell in love with him, and the two of them were inseparable. John would take him and his sister B’mer on long walks almost every day. On the way out he would let them wander and sniff, but on the way back, he would march them home, one on either side. It was a sight to behold. Shortly after B’mer died, we got Dante a baby brother, Joe Joe. He and Joe had a wonderful year together, and then a year ago today, Dante the beautiful miracle dog finally succumbed — probably to cancer. We miss him, but every time it thunders we know he’s finally found peace. A few years ago, B’mer f/k/a It’s a Hubba Bubba appeared as the featured greyhound in an edition of the Greyhound Companions of New Mexico’s newsletter. We learned that since B’mer’s retirement from the track, and through no fault of her own, she had been placed in three different homes in nearly as many years. She was nine years old and needed somewhere to grow old in peace. Darcy and I couldn’t stand it, so we called Judy Paulson, a representative for Greyhound Companions of New Mexico (http://www.gcnm.org) and a wonderful human being to boot. She’d helped us adopt our two big boys, Devon and Dante, and she was delighted to learn that we wanted to give them an older sister. Judy arranged for us to visit B’mer at her foster home that evening. She turned out to be as advertised, a sweet, darling red head with soulful eyes but who always had a smile on her face. She had a tuft of hair standing straight up on the back of her neck, so we called her our Rhodesian Ridgeback Greyhound. A few months ago my brother came for an extended visit, and he and B’mer became fast friends. He nicknamed her “Maime” because of her resemblance to Maime Eisnehower. All she lacked was a pillbox hat. 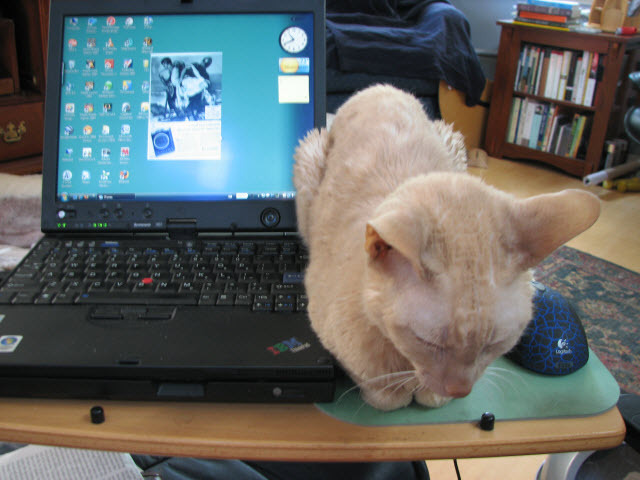 Last April, at thirteen, B’mer finally succumbed to complications resulting from a degenerative spinal condition. After our first greyhound Devon died (see July 5, 2004 post), we declared, “no more greyhounds.” We planned to attrition back to a family comprised of humans and cats. 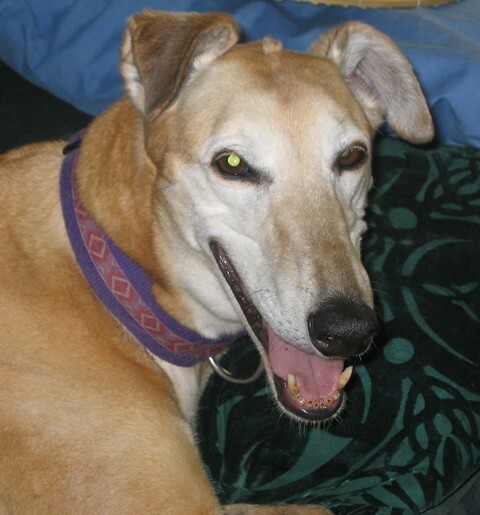 However, Dante, our remaining greyhound, was devastated by B’mer’s absence from his life. He hated being the only dog. In addition, like B’mer, he had become extremely attached to my brother who was slated to move on to LA in mid-July. And then, on July 9, 2005, Darcy’s birthday, Judy called to say she had just retrieved a boy greyhound from the track who was white with brindle coloring and had “funny ears.” He was only a year and a half old and hadn’t cut it as a racer because all he wanted to do at the track was play. We had spent the week mourning our beloved Devon. (He would have been 10 on July 10.) It seemed like fate, if one ascribes to that sort of thing, so we arranged for Judy to bring Joe over. We loved him. Dante loved him. He learned quickly that the cats don’t want to play. The balance has been restored. He was our companion. Our familiar. We will miss him. Big.